At long last we've reached the home stretch in my quest to whittle the Hermessence list down by ~50%. Today's contenders are Vanille Galante and Ambre Narguilé, which coincidentally are the most and the least mercurial perfumes (respectively) of this series, according to my nose. My general impression of Vanille Galante has not changed one bit over the course of several wearings, while my perspective on Ambre Narguilé continues to change, even after having worn it many times by now! Every single time that I've worn Vanille Galante, I've been reminded of a variety of ylang-heavy perfumes, above all Guerlain Aqua Allegoria Ylang et Vanille. The strong ylang emphasis has also occasionally evoked vague memories of a recent testing of E. Coudray Nohiba—although it offers a very different line-up of notes. I decided to do a side-by-side comparison between the 2009 Hermessence and the 1999 Guerlain and discovered that I very much prefer the latter creation. 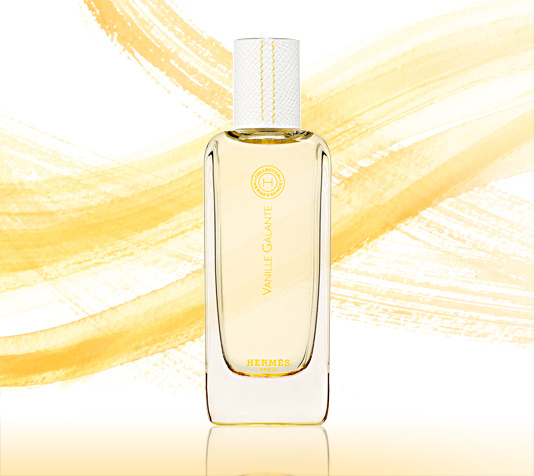 I believe that it is now discontinued, and unlikely to be launched again—at least not in its original state—so I feel fortunate to have a big bottle of that beautiful perfume which, being among the first Aqua Allegoria launches, captured the spirit of nature in a bottle while still being a reasonably complex perfume—by which I mean complex enough to smell like a fully composed perfume rather than a simple combination of a couple of notes. Vanille Galante smells less elegant to my nose somehow. It's certainly not a bad fragrance, but something about the proportions of vanilla and ylang is less than harmonious to my nose. There is also something slightly jarring in this mix. It's not sour or anything like that, but something does not sit well with me. I cannot pinpoint exactly what it is, but suffice it to say that I simply do not feel comfortable wearing this perfume, and I was not sorry to reach the end of my generous 4ml sample. I very much appreciate that Hermès provides the opportunity with such large samples to really get to know a perfume before springing for a big bottle—or even a purse spray. This empowers consumers to have more control over the dispensation of their perfume wallet share, permitting them to go beyond the "passing acquaintance stage" before, not after, acquiring a bottle. After wearing 4ml of a perfume, one has a sound basis for making a purchase, which is obviously much better than relying on hearsay or a skimpy sample and risking buyer's remorse later on down the line. In this case, the conclusion pointed the other way, but I do believe that it comes down to a matter of taste. There are tons of vanilla perfumes, and I should make clear that this one does stand out from the crowd by not smelling at all like vanilla extract! To my nose, the ylang seems to be amplified by something in this composition. Green notes? Lily? Don't know. One thing is for sure: anyone considering adding this fragrance to his or her collection needs to be aware that ylang-ylang looms very large here, at least as large as vanilla, and so much that I myself think that a better name for this particular composition would have been Ylang Galant! My history of Ambre Narguilé appreciation has taken many turns, but somehow never for the worse. The first sample I tested was sent to me by a generous fellow fragrance traveler who graciously shared her large 4ml test tube with me. I do not know why, but that sample was considerably darker and more viscous than the one I received directly from the house. At the time of my first review, I was comparing this perfume to Tom Ford oriental perfumes, which seems way off at this point, but that was what I found: thick and golden, luscious labdanum amber. My fresh sample is clear and only very lightly colored. Over the course of my most recent testings of Ambre Narguilé, I've read a number of reviews in which this creation is compared favorably—or not—to a variety of desserts, including both apple pie and plum pudding! I have to say that I was initially taken aback by the comparison to apple pie. However, I must nonetheless confess that in quick, evanescent wafts, I, too, have had a few Ambre Narguilé apple pie moments! They escape quickly, after which I find the spices less like dessert and more like a complex oriental perfume, but I have indeed experienced—if ever so briefly—what so many other reviewers have claimed to be the essence of this creation. In contrast to my first experience, I no longer find that Ambre Narguilé is much of a labdanum amber perfume, nor do I detect much in the way of ambergris, though it is listed among the notes. This is why, despite my esteem for this sui generis composition, I did not include it in my Varieties of Amber Experience series. I now find that it has a woody, smoky feeling which also keeps it pretty far from gourmand territory. Overall, I'd say that this perfume is complex enough to be many different things to many different people, and even to the same person under different testing conditions—as has been amply demonstrated in my own case. Never a dull or an ugly moment, though. This one is full-bottle worthy. 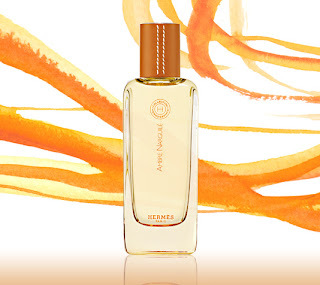 On my wishlist for full bottles are Ambre Narguilé and Paprika Brasil. On my wishlist for the set of four 15ml purse sprays: Iris Ukiyoé, Vétiver Tonka, Poivre Samarcande, and Santal Massoïa. I recommend the entire series for sniffing by those who appreciate fine and subtle compositions.